This segment groups together all users who have the same interest, based on the content they've viewed on your site. We recommend having segments of all your users based on their interests. These can be very useful for targeted advertising, and to gather insights about your audience within Permutive Analytics. 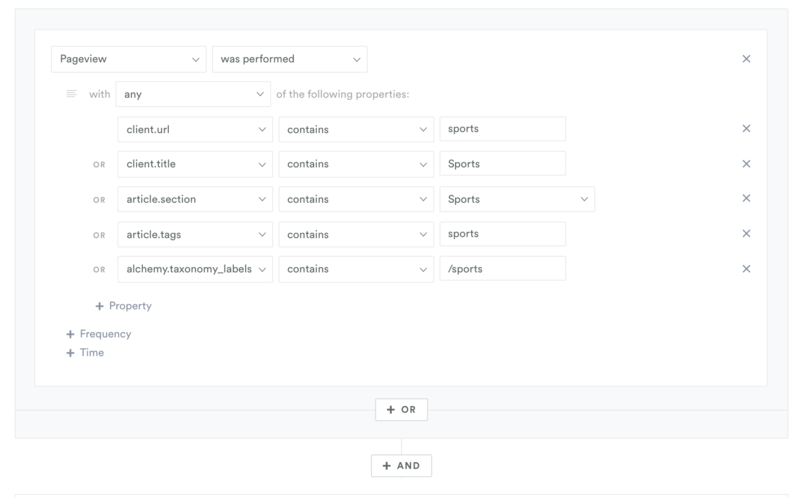 To create segments of sports users, a basic approach is to include users who've viewed 1+ pieces of sports content over their entire user history. Depending on the content of your site and the data you're collecting in Permutive there are lots of different approaches to creating this segment. On every pageview Permutive collects the url and the title of the page. So to create a segment of sports users, include users who've viewed content with 'sports' in the title or url. Note: Strings are case-sensitive, so make sure to use the correct case - or just include capitalised and non-capitalised versions. 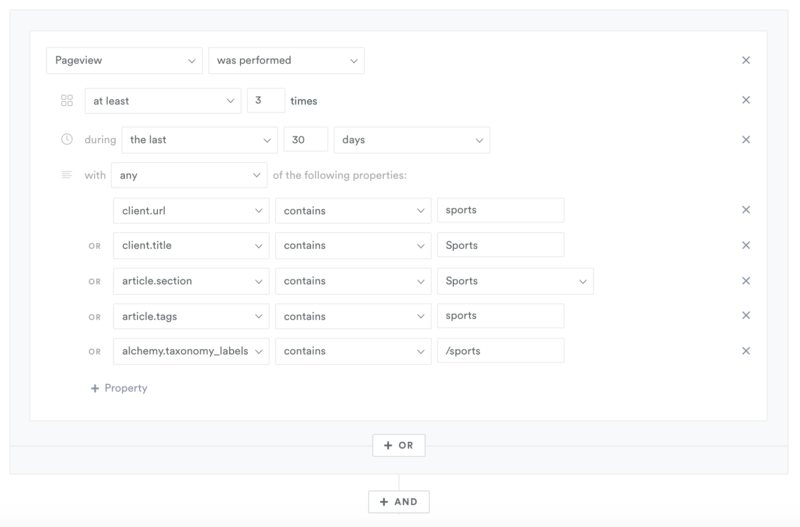 If your project has IBM Watson classification enabled then all your content will be automatically categorised according to the IAB Advertising Taxonomy. The string you enter must exactly match the category. So 'sports' won't work, but '/sports' will. Why? Because taxonomy categories are collected as an array, so 'contains' performs an exact match on each string within the array. Taxonomy categories are collected in a very standard form: all lower case, with spaces, separated by backslashes. To make your segment as large as possible, you may want to include all these properties. This is really straightforward to do, just include every property - making sure you've used 'any' instead of 'all' so they're joined by OR clauses. To create segments of users who are interested in sport, a more advanced approach is to include users who've viewed multiple sports pages recently. For 'Sports Enthusiasts', we recommend including users who've viewed at least 3 relevant pages in the last 30 days. To create this segment, set up the segment as before and add 'Time' and 'Frequency' conditions.